Space Opera | They Might Be Gazebos! I’ve my hard copy for over a week and well the inspirational thoughts are bouncing around inside my head again. Some of you may remember my earlier rants on doing a gonzo space opera game and I did run it for a while with Savage Worlds. 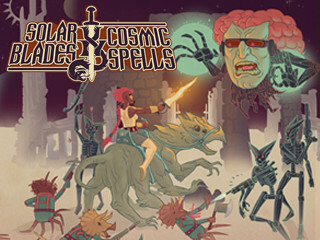 But now I’m thinking about how cool it would be to revisit that universe using Solar Blades & Cosmic Spells. More about that much later. There’s way too many things bouncing around inside my head. Instead the bulk of this post is throwing out there a couple of things that really inspired my for the campaign and hopefully might inspire you too. 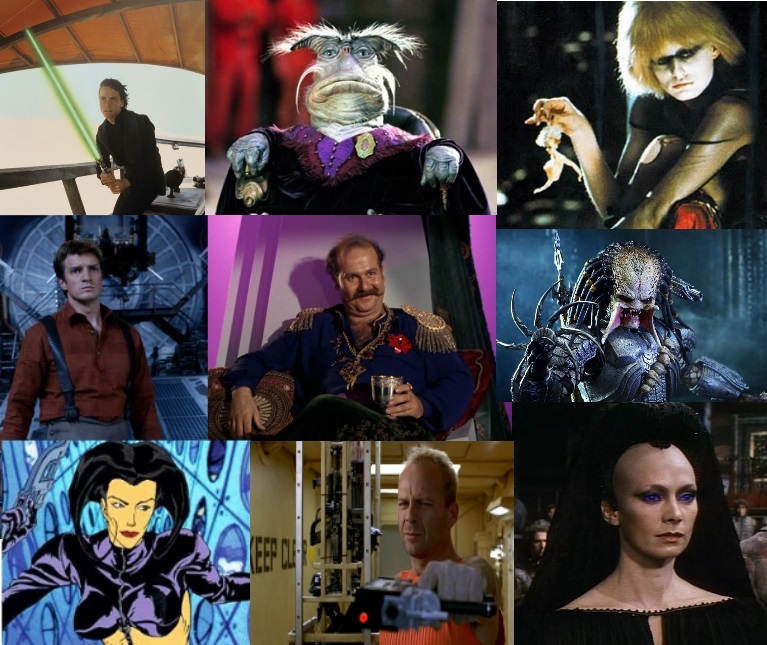 First and foremost, a favorite of mine is Farscape. Lets’ see you’ve got humor. Crazy weird aliens like crazy. A big wild universe. I won’t go through the whole background, setting and so forth. If you’re reading this then you’ve got Internet access. 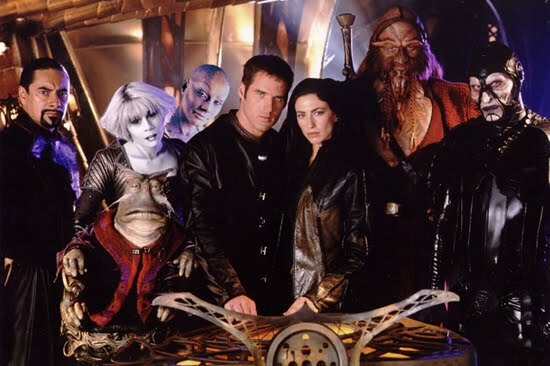 How ever if you’ve never seen Farscape, give it watch. If you’re short on time, may I suggest watching the pilot episode to get the general idea then follow up (and skip a lot) and watch the three parter, Liars, Guns and Money. They rob a bank. And you’ll probably go down a Farscape wormhole. No pun intended. The second also aired on the SciFi Channel (when it was called that). And that’s The Lexx. Now The Lexx was much weirder. Heck one of the main characters was an undead poet assassin. NO really. It had a real Heavy Metal mag vibe. 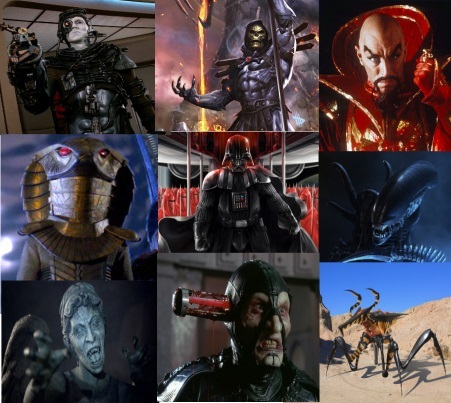 Heck, you’ve got villains named the Divine Shadow, a Bio-Vizer, and Gigashadow. Once again it’s a crew of misfits on a really big ship. While it is inspirational, the overall plot can be a bit difficult to follow. Like I said before, I won’t go into the whole universe here. And to wrap thus up I’ll pull up a couple of old collages. May this inspire you! This is why you stop by your local Dollar Tree looking for that nifty gaming or even geekery bargain. That’s right Star Wars Micro Machines three packs for a buck each. Of course, I had to grab some. Because like Space Opera RPGing that’s why. Yeah I know a lot times there’s just cheap stuff that may or may not be that cool and their inventory doesn’t change that much. But with a little perseverance and some luck, you find those treasures. It’s just like a dungeon. 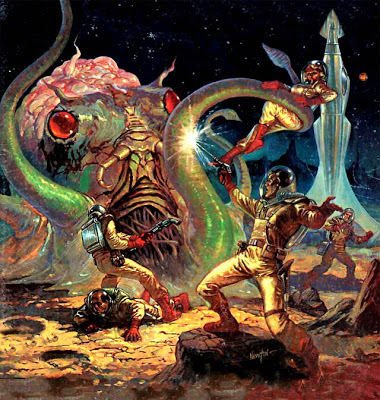 Well that Savage Worlds Space Opera game got off the ground last week. (No pun intended.) Here’s what the players came up with: And sorry the silly GM left his notes laying about so I forgot most of the PC’s names. Tyler Titanic AKA TyTi: That’s the ship. I went ahead and gave them light freighter that in no way has ever been used for smuggling. The no nonsense bounty hunter and pilot with a few enemies and a few connections. The beautiful Katana-Wielding Rebel (or Terrorist depending on your point of view) who likes to blow things up. A deep space salvage expert who also happens to really good ar gunnery and probably not a pirate. The ray gunslinging guy who sounds like Batman. The crazy SPACE GOBLIN! engineer. And yes it is spelled SPACE GOBLIN! And Nut who is not Groot. The party got hired to find out why a supply ship has gone missing on its run to a remote gas mining outpost orbiting a gas giant. I hate doing whole sessions write ups but here’s the highlights of the session. As a GM I kit bashed a couple of Savage One Sheets for the adventure (Routine Extermination for FEAR Agent and Ghost in the Machine for Last Parsec) and I’ll try to keep this spoiler free. The group miscalculated their hyperjump and ends up running out of food four days before they get to their destination. So yeah the party is in deep space and no food. The stations is overrun with rogue killer robots and the crew (except for some blood and a finger that the SPACE GOBLIN! ate) were missing. They blast their way thru a bunch of bots with no problem until they get to the main processing chamber. There they find a huge bot, building more bots and doing something else but they just aren’t sure what. This fight is pretty bloody for the player characters with about half the party having at least one wound. The Rebel Bomb Maker (who is not a Terrorist) decides to throw a bomb this goes very badly and doesn’t even detonate and lands way off target (Read way too close to the PC’s). The bomb does go off when they finish off the big bot which explodes on it’s own thus causing the bomb to go off. This rips a huge hole in the floor and half the party gets banged up even more and starts falling down the umbilical used by the miners skim gas from the planet’s upper atmosphere. And that’s where we ended the session. Yes. I should be making a character sheets and outlining all the horrible things I plan throw at the player characters. But I stumble upon some pretty cool star ship models on Amazon. Now they ain’t that new. And I went cheap only got a couple of the $4 ones (That included shipping from Japan). 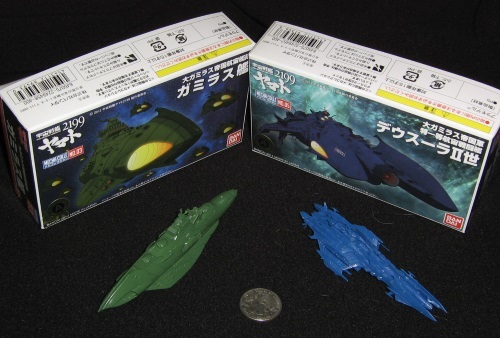 I wanted at least a couple of capital ship mini’s that weren’t Star Wars. That’s right Battleship Yamamoto. Now there’s a ton of them and you have to dig through the various scales and prices but there’s some a couple of gems there. They are snap together models so no glue. But there are some damned tiny pieces that were pretty difficult for my big old grognard fingers. Once assembled the models are about 4 inches long and there’s some really good detail. (I should do a little painting on these some time). 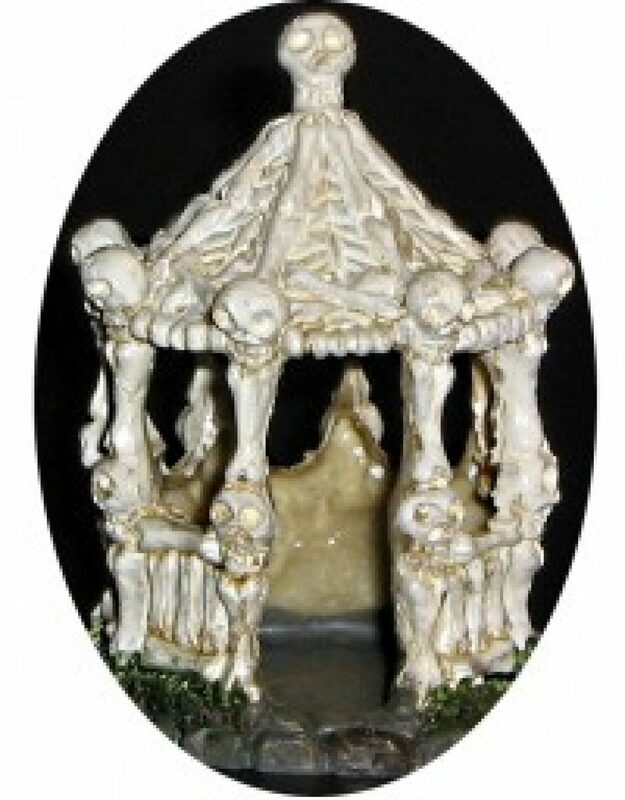 But with the detail also comes some pretty delicate bits here and there so I don’t know how well they will stand up to just being thrown in box and hauled off to a game. So there may be some extra packing involved. It’s been a long time since I messed around with Savage Worlds. Well, here’s the first alien race for player characters. Imagine a cross between a monkey and an iguana with a sick sense of humor, warped knack for technology and a love of money. Then you have the Gremlox. Gremlox Ingenuity: Gremlox gain a +1 bonus to Repair skill rolls. However, any other character (including other Gremlox) have a -2 penalty to attempt to repair or maintain that equipment. Tough Little Bugger: Gremlox have -1 Toughness but also have the Hardy Edge. *It may sound strange to use Weird Science in a space opera game since there’s already so much technology. But unstable nature of Weird Science and those possible Glitches make it perfect pulpy fit. There will be more on the way and some house rules too. As regular readers well know I’ve been on a streak about running a space opera game. And I’ve done a couple of posts and talked to the FLGS group and looks like things will get off the ground so to speak. So in my copious free time, I need to do a little brainstorming. First of all. Yes. Savage Worlds. I’ve already been asked “Why not White Star?” Heck, I love White Star and OSR stuff. But one of the players did mention they’d like do something that wasn’t d20 based. For me that left two choices. The good Star Wars d6 and Savage Worlds. I have fond memories of the d6 system and ran it a few times back in the day. However, I wanted to add a few gonzo elements that just didn’t quite work in my mind with d6. And (this is just my opinion) I think Savage Worlds is a better system. Not saying that d6 is bad, it’s just Savage Worlds edges it out here and there like initiative, character generation, and most importantly I’ve had enough experience with Savage Worlds I can tweak a bit and not totally break the game. Additionally, one player has had a less than stellar (no pun intended) experience with Savage Worlds due to some GM issues. So it’s nice to have a player willing to try a system again. Now for some nuts and bolts. The SciFi Companion is cool and I’ll be using a couple of things from like some Edges, Hindrances and cinematic Ammo rules but the bulk of the inspiration is going to come from Daring Tales of the Space Lanes by Triple Ace Games and Slipstream. I really want to run with a pulpy space opera type feel. And these two fit the bill. As a bonus, there’s some good adventures and inspiration from The Last Parsec as well. And a similar to that there’s some great adventure ideas and inspiration from Bulldogs. I’ll have some more posts in the future about the setting, alien races, house rules and few other things.